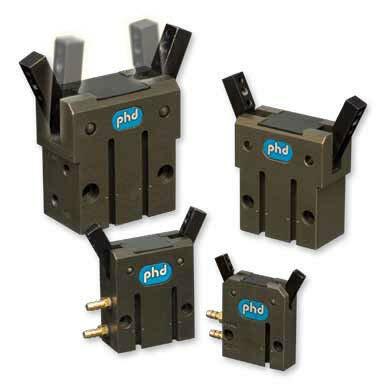 PHD introduces the new Series GRV Compact Precision Angular Pneumatic Gripper. New from PHD Inc. Contact FPE for pricing. The Series GRV is a compact, rugged precision gripper available in four sizes that can support large moment capacities and long tooling lengths. The combination of design and features makes the GRV a superior choice for a wide variety of automation applications. A slim design allows ample space for “stacking” grippers in a confined area. Other benefits include cleanroom fluoro-elastomer seals and lube options, manifold porting, multiple mounting locations, and PHD’s superior delivery. The Series GRV Angular Gripper is available now at Fluid Power Engineering. Contact FPE for ordering information/pricing. FPE is proud to offer you the latest in product advancements! If you are working with a supplier that doesn't... you may be missing opportunities to enhance your company's productivity, save money and become more competitive in your field. Why not give FPE a call or drop us a line today to see how we can help? FPE's Steve Kocmond proudly accepts the Gold Supplier Award. CONGRATULATIONS to FPE's Steve Kocmond, Barry Allen and the rest of the team. For several years in a row now, Fluid Power Engineering has been the proud recipient of the Gold Supplier Award at one of our best clients. 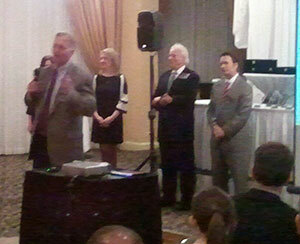 Last night, Steve accepted the award once again on FPE's behalf. We work hard to provide a level of service that meets such high standards, and we're honored to be recognized in this way. ... and from our top supplier. 37 Series circuit bar® pre-wired by FPE that uses just one cord set. The result? Time and cost elimiated for the client. That's our biggest reward of all! Piab announced that they have expanded the range of COAX® integration products they offer. piCHIP is a new family of surface mount cartridge integration units, which Piab says will simplify the integration “preparation” versus preparing for a traditional cartridge integration. The concept of the product resembles Piab's existing Chip/MINI pump plates (MINI pumps without the connection part). As a first step, we're told it will be introduced for the MICRO cartridges, but soon expanded for larger cartridges as well. piCHIP will be available with one cartridge or two cartridges placed on top of each other. Click here to view the piCCHIP data sheet. Teledyne Dalsa just introduced a brand new complementary device for Teledyne's DALSA BOA smart cameras. The BOA NEXUS Smart Bridge works with existing BOA camera systems to expand their information sharing and monitoring capabilities. FPE takes pride in offering you the latest technology. That's why we're happy to add the BOA Nexus Smart Bridge to the complete line of Teledyne Dalsa products we carry. View the official announcement here. For more information, Give FPE a call: 847-364-7455.